Although Zig Ziglar had to deal with a variety of difficult circumstances throughout his life, he was able to show the world what is possible with the right combination of persistence, passion, positivity and faith. During his career as a motivation speaker, Ziglar, who was often introduced as ‘a human exclamation point!’, inspired the masses with his wit, charm and heartening tales of perseverance. Additionally, Ziglar was able to influence countless others with his writings and audio CD seminars. For his motivational contributions, he’ll forever be regarded as one of America’s most celebrated inspirational icons. While each and everyone of us will undeniably face a number of trials and tribulations throughout our lives, there are few individuals who’ve been dealt a set of cards comparable to the ones given to Zig Ziglar who’ve still been able to rise to the top. Although he was forced to deal with a number of unimaginably disheartening events, the kinds of circumstances the majority of us fear most, the motivational master wouldn’t be stopped from inspiring the masses with passion, enthusiasm and an unparalleled zest for life. It was just nine days after he was prematurely born in Coffee County, Alabama, and given the birth name Hilary Hinton Ziglar, when a local doctor examining him regrettable told his family that the young child had passed away. Although one would assume that the doctor’s prognosis meant Zig’s life was over, this would actually be just the start of his amazing journey as he came back to life while his grandmother held him in her arms. Unfortunately, however, this wasn’t the only time the young boy and his family would have to deal with the prospects of prematurely losing a loved one. In 1932, when Zig was five-years-old, he and ten of his siblings would have to cope with losing their father and youngest sister over the course of only two days. For their mother Lila, who Zig credited with keeping him on the right path, it was during this tragic time when she’d put the family’s well-being in the hands of God. Throughout his youth and into his adolescence, Zig Ziglar and his family lived in a number of different cities across the southeastern United States. During these years, Zig started working at a young age to help his family make ends meet, began regularly attending church under the guidance of his mother, and also developed his infamous southern drawl. Undoubtedly, it was also during this time, because he was tasked with selling food such as peanuts and vegetables on the street, when Ziglar would start harnessing the business acumen and communication skills that would later make him famous. Over the course of the next 20 years, Zig Ziglar would continue to hone his business and communication skills while climbing the professional ladder. It wasn’t until 1970, two years after he became the vice president and training director of the Automotive Performance company in Dallas, Texas, however, when Ziglar made the decision to become a full-time motivational speaker. 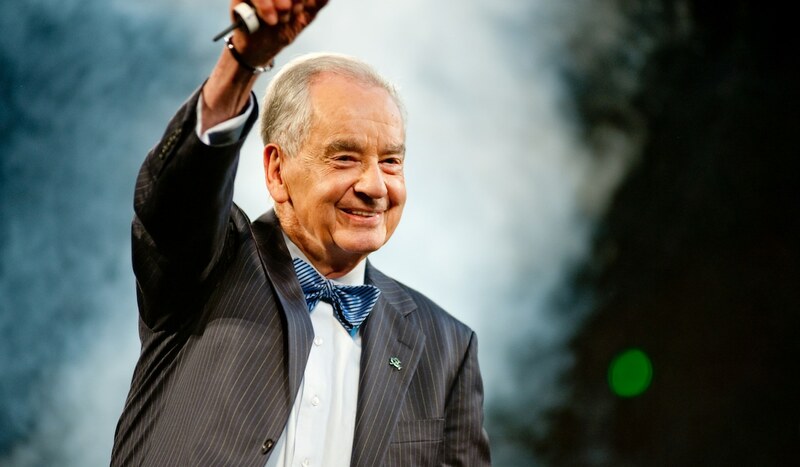 Although he encountered some struggles in the early going, Ziglar’s believed the turning point of his career came when he became a born-again Christian in 1972, at the age of 46, and began incorporating ‘biblical principles’ into his speeches. In 1975, Ziglar would publish his first book, See You at the Top, and although the book was rejected by 30 publishers, it would eventually go on to sell over 250,000 copies. Throughout his career, Zig Ziglar would inspire a countless number of individuals with his teaching on being compassionate towards others, working hard, and making an unwavering commitment to turning one’s self into the best person they could be. In addition to publishing over 30 books, including 11 best sellers, he would also win numerous awards for the various types of work he did and become one of the most highly sought after motivational speaker of his era. Although he would unfortunately have to deal with losing his own daughter in 1995 to a lung condition, Zig Ziglar would continue his motivational work until he passed away in 2012. For his contributions to the self-help and personal development fields, he will forever be remembered as one of America’s most celebrated inspirational icons. Throughout his career as a speaker and author, one of the most important messages Zig Ziglar would relay to his audiences revolved around the idea of work-life balance. Because many of his speeches and seminars would take place in business settings, where status and money were the primary aims of his audience, he went to great lengths to illuminate what makes someone truly successful. He famously told us, “I believe that being successful means having a balance of success stories across the many areas of your life. You can’t truly be considered successful in your business life if your home life is in shambles.” To help get this message across to his audiences, Ziglar created a balanced living model which he called the ‘Wheel of Life’. As you can see, the inspirational icon believed that we should set goals in a way that creates balance with our career, finances, spirituality, physical fitness, intellectual aims, family and social life. Zig Ziglar was a big advocate of compassionate living and constantly reminded his audiences of the benefits that individuals obtain from helping others. During his speeches and seminars, he would regularly talk about the importance of helping others and treating them with dignity, honest and respect because he understood how a willingness to help the people we work and live with always is reciprocated with similar assistance. “You can have everything in life you want if you will just help enough other people get what they want,” he told us. Yet still, beyond acting in a selfishly unselfish manner, the great motivational master knew first hand of the emotional rewards that come to those who treat others with compassionate morality without expecting anything in return and he made sure to tell his audiences of this truth.